The advent of small satellites and the enabling satellite miniaturization technologies have opened abundant opportunities in the space industry. From technology development and on-orbit demonstration missions, to mega satellite constellations, it has brought a palpable change in the space ecosystem. While the relative simplicity and the associated low-cost architecture are enabling (the much needed) easier access to the space applications, the challenge lies in the readiness of the existing infrastructure to support this rapidly growing market. 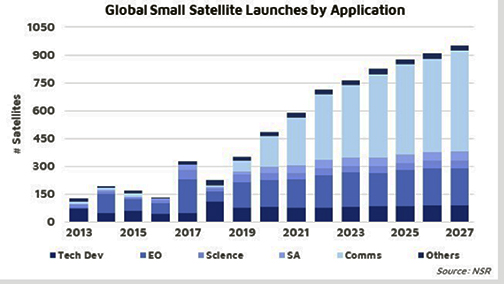 Despite a 30 percent decline in launch rates in 2018, smallsats are expected to regain growth in the near terms and over the next decade. 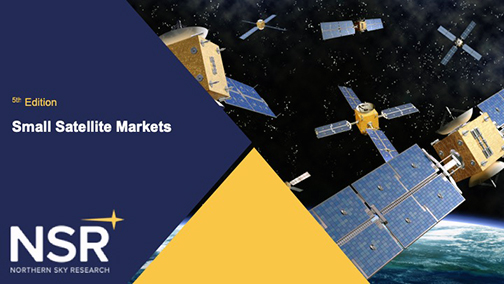 NSR’s Small Satellite Markets, 5th Edition, forecasts more than 7,000 smallsats to be launched by 2027, with constellations expected to dominate the market which, in some cases, are planning to deploy unprecedented numbers at a record pace. A market that has historically been relatively slow to develop will now experience an accelerated expansion. This is bound to put immense pressure on the existing infrastructure and the different stakeholders in the supply and value chain. A quick look at some of the elements of the industry below outlines the potential repercussions of this unparalleled growth in the market. 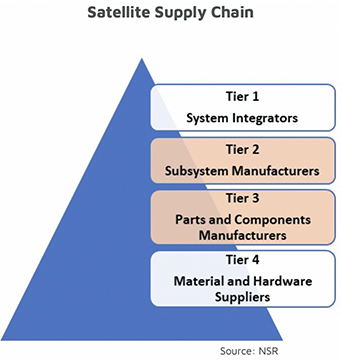 Successfully and sustainably increasing the lead time of satellite manufacturing from an average two to three years per satellite to as many as 40 satellites per week (just for a single constellation) will rely upon supply chain management at all tiers of satellite manufacturing. The requirements for space-approved components and materials create barriers to entry in the supply base. In addition, the understandable preference and benefits of choosing local suppliers for ease of operation as well as requirements such as ITAR further reduces the supplier pool. Based on the current and estimated trends, as the pressure to keep the costs low and lead times short trickles down the supply chain. Tier 2 and Tier 3 components, such as electronic systems and subsystems, are expected to create considerable bottlenecks. While new companies are entering the market to help unblock the promised value and reduce certain constraints, as in the case of propulsion systems, the overall supply growth rate does not seem to be agile enough to cope with the growing demand. Launch is already one of the biggest constraints in the industry. Although new players, such as Rocket Lab, are answering this ongoing problem by offering smallsat dedicated launchers at deeply reduced prices, the long-term sustainability of these services remains a concern, due to the challenging business case. There is also a growing number of established players that include SpaceX, ISRO and Roscosmos that are offering rideshare options at highly competitive prices. However, scheduling delays (as experienced in the recent years) and sub-optimal orbit insertion, in many cases, makes this option less than ideal to adequately support the smallsat market. In spite of the growing number of players, serving both dedicated and rideshare/ piggy-backing options, the launch segment is expected to remain one of the biggest bottlenecks of the small satellite market over the next decade. Another seldom mentioned vulnerability of the growing smallsat market lies in the lack of adequate space traffic tracking and management regime. As the number of satellites on orbit starts to grow, there is a burgeoning risk of collision and general disarray, made even worse by the absence of propulsion on many small satellites. It is, therefore, imperative to establish and enforce rigorous, international regulations for the different phases of launch including pre-launch notification, on-orbit maneuver tracking, right-of-way evaluation, end-of-life disposal and re-entry, among others. As the industry enters this new and essentially unfamiliar phase, having timely and — more importantly — accurate information will also be crucial for collision prevention as well as to enable execution of the regulations. 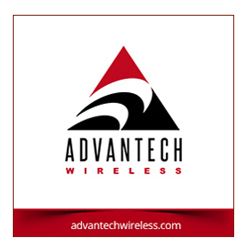 In the past decade, a vast number of new players have entered this space with diverse business models targeting a multitude of applications. With the influx of innovative concepts from pay-per-use model to satellite-as-a-service model to mass production facilities, there is a solution for every requirement, making access to space easier than it has even been previously possible. As the industry starts to get acquainted with the new “normal,” the vulnerabilities of the existing infrastructure are bound to be exposed — smallsat markets need a solid foundation to ensure the strong growth expected that will lead to a sustainable market in the space ecosystem. Ms. Sachdeva joined NSR in December 2017. Prior to joining the team, she worked as the Business and Marketing strategist at Satellite Squared. During her time there, Ms. Sachdeva’s main activities included the market analysis and segmentation, identification of potential customers as well as the valuation studies for the company’s core product concepts: On-Orbit Servicing and Satellite Power Boosting. Ms. Sachdeva completed the Toulouse Business School’s Aerospace MBA program and holds a Masters degree in Aerospace Engineering from Monash University, Australia. During her studies, she worked on various aerospace assignments and led a research project that investigated the existence of a convergence between the internet and space industries. The study looked at the future of the telecommunication satellite constellations from the technological, economical and legal perspectives. As part of her MBA internship, Ms. Sachdeva’s work also included a comprehensive study on the funding opportunities for start-ups within the space industry, with a geographical evaluation for new space ventures.